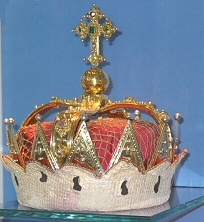 Crown of the Archduke of Austria. The title of Archduke (feminine: Archduchess) (German: Erzherzog, feminine form: Erzherzogin) is a rank above Duke and under King. It is very rare. It was used only by males of the House of Habsburg. The English word is recorded only since 1530, derived from Middle Latin archidux, from arch(i)- (see arch- (adj.)) + dux 'duke' . Archduke (Erzherzog) is a title distinct from Grand Duke (Großherzog or Großfürst) that is used in some other German royal houses and still in sovereign Luxemburg. Poggle the Lesser was the Archduke of Geonosis, a planet from the Star Wars universe. Maria Teresa of Austria wife of Louis XIV of France. known as "Marie Thérèse". This page was last changed on 8 February 2015, at 23:44.